Another season of Riverdale, another musical episode. Thank the Gargoyle King/Autotune, Jughead (Cole Sprouse) finally sings in this one! Jughead's got a lot to sing about. He found out his mom converted the old Jones trailer home into a Fizzle Rock lab. He and Betty (Lili Reinhart) set fire to the place and make out in a car while Jughead's childhood home burns to the ground. Who said romance was dead? Speaking of dead, Kevin is haunted by memories of last year's musical and so he recruits Evelyn to co-direct the musical. It's only fitting since the Farm is producing. Remember kids, the producer is the financial manager of a project who has executive decision making power. This distinction is seldom made. This year's musical is Heathers, a musical about high school students and the mental health issues they face. This episode doesn't pull punches. Toni and Cheryl duke it out in a sing off. Cheryl's incessant bullying almost causes Toni to leave Riverdale High. By episode's end, the two have reconciled. Such is the fickle social hierarchy of high school. Veronica's (Camila Mendes) parents are splitting up. Her father claims it's because her mother tried to have him killed. Poor Veronica, it's easy to forget how fragile she was when she first came to Riverdale. The only thing keeping her going was likely the fact her father would soon be out of jail and the Lodges could be a family again. In a moment of weakness, Veronica gives into Reggie's persistence and the two make love. Their pillow talk is one of the most raw moments this season; a rare treat. Meanwhile, Archie (KJ Apa) and Josie finally make it official. I like how they addressed that they only got together because they both felt lonely. That's such an interesting debate. So many of us feel like we need to wait for the "one," and should have impossibly high standards. 1. Our standards are constantly changing. They are never fixed. The older we get, the less we care about looks. Remember that person in high school who liked you and you didn't like them back only because of their looks? I bet they're not looking too bad these days. I bet you've even asked yourself, "What was I thinking?" By the time you pass your mid-30s, your standards are completely different than what they were at 15. You almost want to find a partner who isn't right for you now, but right for you in the future. Think of it as an investment. 2. Humans are impulsive creatures. Our sexual desires are such so that humans mate on impulse, and then end up having a baby. Imagine going on a first date with someone and asking yourself, "Is this the person I want to have babies with?" That's so much pressure! Maybe it's not about finding the person you think is perfect for you presently, but who will be perfect for you in the future. In that regard, Archie and Josie are a perfect match. Sure, Josie isn't Veronica. Good. Veronica is the girl you have a fling with. Josie is wife material. At 35, I would take Josie over Ronnie any day. Betty and Jughead's musical number worked on many levels. Just as Betty brought Jughead out of his shell in the show, Lili Reinhart has slowly brought out Cole Sprouse out of his shell. Cole, who in the past was very shy about singing, decided to sing in this week's episode in a duet with his real-life girlfriend, Reinhart. Whether it's the actors or their characters, the two are indispensable to one another. A better looking, higher status person could come along, but it wouldn't matter. These two complete each other. Cole's acting improves tremendously when he's opposite Lili. The smile she puts on his face can't be faked. That's real love. As Chad Michael Murray (who plays Evelyn's father) slow clapped in creepy approval of the musical's grand finale, I found myself at an intellectual crossroads. Riverdale isn't all bad, but it isn't all good either. 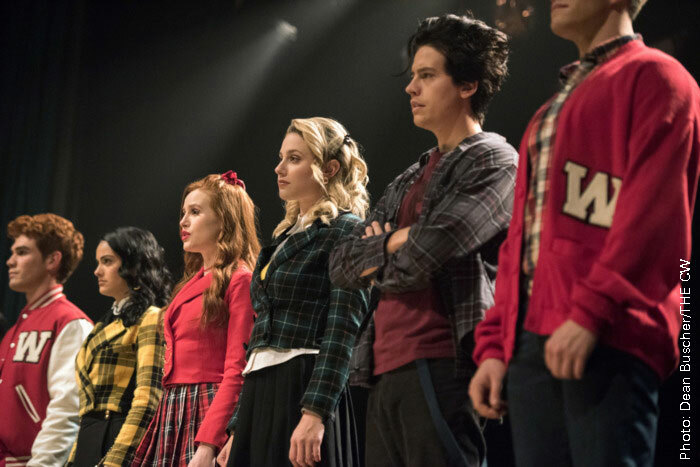 These final episodes will be the ultimate test to see if Riverdale is truly worth watching. IF Riverdale can end this season with a satisfying payoff for all or most of our characters, I will concede and say this is a show worth watching from season 1 to season 3. However, if the ending is a hot mess, I will be resigned to tell people "season 1 is good, but don't watch any of the other seasons. Maybe a few episodes from season 2."